Paul Hough’s The Human Race, which has been compared to Kinji Fukasaku’s Battle Royale, Gary Ross’ The Hunger Games, Stephen King’s “The Long Walk,” Nimród Antal’s Predators and David Cronenberg’s Scanners, is a sci-fi thriller best viewed metaphorically from start to finish. While it is unable to fully carry out its enthralling premise and vision, the film is worthwhile as an allegory on the nature of the human race. Eighty strangers from different backgrounds are extracted from their every day lives and appear together in an unnamed location without explanation. Among them is a one-legged war veteran (Eddie McGee) and his fellow vet (Paul McCarthy-Boyington), two deaf individuals (Trista Robinson and T. Arthur Cottam), a decrepit man with a walker, a pregnant woman, a Chinese woman and young boy who cannot speak English, a priest and a homeless woman – people from all walks of life, many clearly disadvantaged in some way. The ominous rules of the race are reiterated time and time again in the racers’ heads in their own droning voices and languages; even the deaf duo can hear this. “Only one may win. The school, the house and the prison are safe. Follow the arrows or you will die. Stay on the path, or you will die. If you are lapped twice, you will die. Do not touch the grass, or you will die. Race or die.” Amid the chaos, rules are broken. People are confused and frightened. As they drop like flies, mainly in the form of head explosions, the ones still standing hear the survivor countdown: 80, 79, 78… hoping to make it to one. This seems like a good setup, but the pacing of the movie is off. Race at times feels slow, even during action-packed moments and despite its succinct runtime of 87 minutes with credits. The characters go through various buildings, following the arrows as they are directed, but it is unclear as to where the racers are on the track (or even what the setup of the track is) and who is lapping who. Thus, some of the urgency is lost and you’re left with what appears to be people freaking out and running in different directions or just sitting around, helpless. The head explosions, commencing with that of the short-lived cancer survivor, are the foremost means of death. Throughout the film, the splatter of brains and litter of headless corpses grow and grow. The gore aims for relentless, bloody fun, but eventually loses its appeal due to repetitiveness. While there are a few fight scenes including ones with a violent cyclist (Fred Coury), it would have been more entertaining to witness the participants strategically plotting one another’s deaths a la Battle Royale versus simply lapping each other or pushing each other onto the grass, with subsequent decapitation. In spite of this, the film works, in an allegorical sense. When looking at it that way, it is aptly named in that the race to which the participants are subjected is a representation of the nature and mortality of the human race. While we don’t normally encounter this type of pressure cooker life-or-death situation, we are put to the test when faced with alarming, unpredictable situations, which can happen at any time. In Race, some handle the deadly “survival of the fittest” challenge with grace and compassion. Some question it and see it as a test from God. Some take charge. Some approach it with brutality. The film conveys these differences, along with what fear can trigger in people. This film also showcases a diverse range of actors, from the real-life amputee Eddie McGee to those of assorted races, ages, creeds and abilities. The diversity is a positive thing but reminds us that not all men are created equal and some have a tougher time getting by in the world than others, as they do in the race. However, that does not determine a person’s likelihood of survival or success, as the one-legged protagonist and all of the other “misfits,” around whom the film is centered, prove. It’s a person’s determination and adeptness that keeps him or her going. The hordes of other individuals who are likely “normal”— young, healthy, all limbs intact, etc. – are merely glossed over extras. Race doesn’t care about them and they are some of the first to die. To top it all off, there is a twist ending. It makes the audience think abstractly about something beyond the human race’s interaction with one another – something everyone has likely questioned at one point: our place in the universe and in the grand scheme of things. 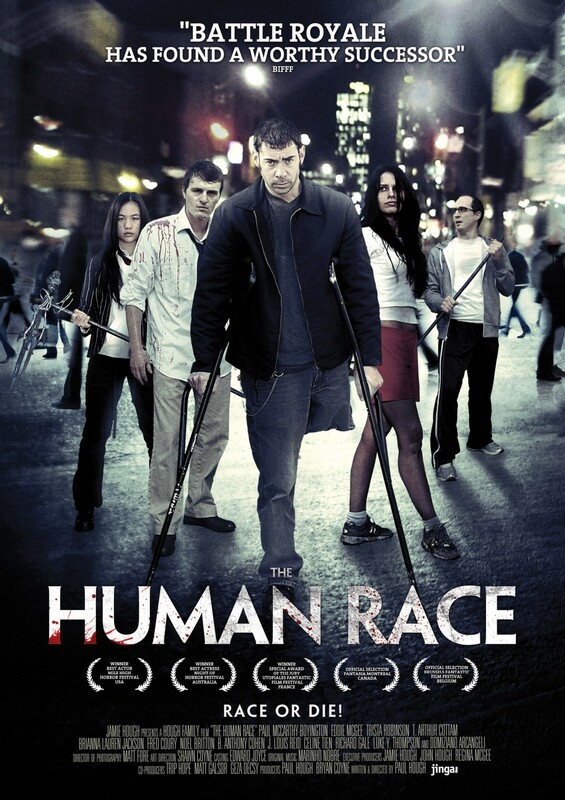 British director Paul Hough’s sci-fi thriller aired in theatres on June 13 as a limited release.